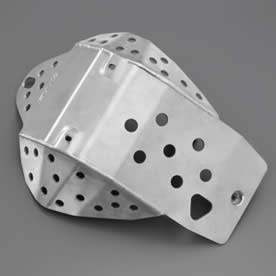 This YZ250F Aluminum skid plate is designed with side skirts that help protect the lower frame rails, critical engine components, water pump, ignition cover and clutch components in the toughest off-road conditions. See and buy YZ250F Yamaha parts on our microfiche pages. See and buy 2009 YZ250F GYTR accessories on our accessories pages.